The governing body for university sports in Canada signed a long-term contract with Sportsnet in 2013. U Sports was hoping to boost the profile of the league with expanded coverage and a refreshed approach. Instead, ratings are down, fewer events are being broadcast and questions surround what comes next for U Sports on television. The Silhouette looks at how we got here and what may lie ahead. 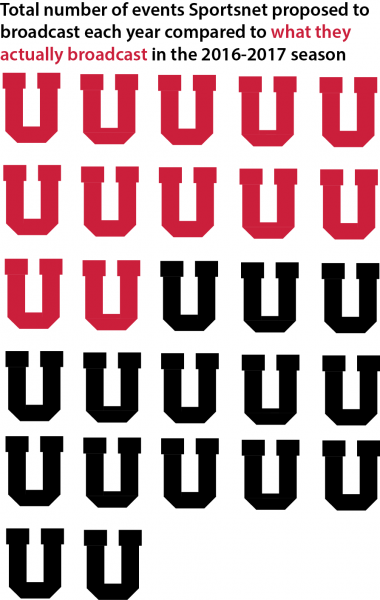 There are a number of problems facing university athletics – now known as U Sports after an organizational rebrand in 2016 – but none are bigger than the current television situation. In 2013, Canadian university athletics and Sportsnet joined forces, shifting the broadcast rights from TSN to the other sports channel. 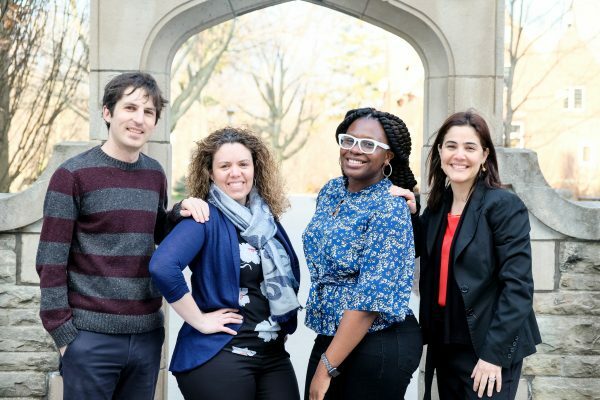 The agreement was met with some fanfare because of what it promised. Instead, the next four years would see significant changes, both with U Sports and Sportsnet, casting doubt on the viability and potential of Canadian university sport. A reread of the May 2013 press release announcing the six-year Sportsnet television contract reveals how much has changed. The Sportsnet executive quoted in the release, Navaid Mansuri, has not been quoted about Canadian university sport since then. The CEO of U Sports, then called Canadian Interuniversity Sport, abruptly resigned in Jan. 2015. That release also boasted that the Score – a television channel bought by Sportsnet – would “be one of the main hubs of CIS coverage”. The Score was renamed “Sportsnet 360” later that year and ditched their coverage of Ontario University Athletics football and basketball in the following year. The release ends with a bold claim: “by the end of the six-year partnership in 2018-19, as many as 27 CIS events could air annually on Sportsnet.” Some new sports could get a national spotlight. For athletes and coaches competing in sports like volleyball, rugby and soccer, it felt like their accomplishments would finally be recognized. To date, this has not materialized. Four years into the agreement and Sportsnet continues to broadcast the national championships and semifinals for football along with both men’s and women’s basketball – the same slate listed on that initial press release. Men’s hockey was broadcasted this year, but women’s hockey was not. Money is at the heart of the television rights issue. In the current age of cord cutting and piracy, television networks are constantly trying to secure the rights for products that will capture a live audience. While sports is not iron-clad, it is one of the few programming options that has retained an audience. That is why you see massive contracts being handed out for the sports broadcast rights. However, U Sports is the anomaly here. In 2013, the Globe and Mail said that U Sports was receiving $100,000 in the first year of the contract from Sportsnet. Neither U Sports nor Sportsnet would confirm that number to the Globe and Mail. This number pales in comparison to the billions of dollars brought in by other sports organizations. The rights to the National Collegiate Athletics Association’s men’s basketball tournament cost CBS-Turner $10.8 billion. The difference speaks volumes. For the 2015 winter championship season, Sportsnet reimagined their coverage approach. Instead of having the hockey and basketball tournaments spread over a few weekends, the tournaments would be put on one weekend and all covered on the specialty channels Sportsnet 360 and Sportsnet One. This meant 20 hours of U Sports programming over a Saturday and Sunday in mid-March. Sportsnet was attempting to compete with Hockey Night in Canada during the National Hockey League’s playoff race. These issues persist. Attendance at the men’s basketball tournament was extremely low in 2016, though this is hard to quantify because of a lack of attendance numbers from the organizers at the University of British Columbia. Other sports struggle to capture a live audience, reaffirming the complaints from the year before. U Sports departments are often small shops with limited resources. This makes it difficult for schools with multiple teams competing in championships to get the logistics taken care of. Some teams have to find more therapists for the athletes; other schools need to contract out for help building media guides. The 2016 tournament also went up against the opening weekend of the NCAA March Madness tournament, even though Sportsnet recommended they change the dates to avoid this issue. None of these events rated in the top 30 sports broadcasts for their week, getting beaten out by events like a non-major golf tournament and the World Indoor Athletics Championships. Despite being billed as a success in 2015, this format was abandoned in 2017. Six months after Sportsnet inked a deal with U Sports, the Rogers-owned company signed a 12-year $5.2-billion contract for the National Hockey League broadcast rights. Initially seen as a watershed moment for Sportsnet, the company appears to have overpaid for the product. According to the Globe and Mail, ratings fell by 16 per cent in both the 2013-2014 and 2015-2016 season. This led to a decline in advertising revenue. Rogers Media laid off 200 employees in January 2016 and said all areas were affected except for the Toronto Blue Jays. What does this have to do with U Sports? It limits the resources available to grow the league, which is what the Canadian university sports organization was looking for when it signed with Sportsnet. The agreement was framed as a partnership between the two parties, with Sportsnet providing coverage and airtime for a league looking to break out of the local communities and create a stir nationally. The two parties have a reason to believe in that. ESPN built its empire on college athletics. In the early 1980s, ESPN picked up the early rounds of the NCAA men’s basketball tournament and essentially created March Madness. A court ruling later that decade allowed ESPN to broadcast multiple college football games, creating a television product that other networks refused to. Now, Sportsnet will mostly repost U Sports press releases or wire stories. They have some original video content, but the U Sports page still has a story about a soccer championship from November featured on it. The Sportsnet U Recruited competition does not appear to be running this year. However, Sportsnet did broadcast regular-season football games in 2016. According to the Toronto Star, ratings for this were poor. With cuts to the Rogers media departments, it is no surprise to see U Sports coverage fall to the wayside. Ratings and advertising revenue could improve as Canadian NHL franchises become more competitive, though it is unclear if this will improve anything for U Sports. Sportsnet and U Sports are locked in to a deal until 2018-2019, and public comments show some hesitation on the broadcaster’s end. In a Toronto Star article from Sept. 2016, Sportsnet president Scott Moore spoke about the future of their relationship. And if viewership and revenue are what Sportsnet is chasing, that paints a bleak picture for U Sports. 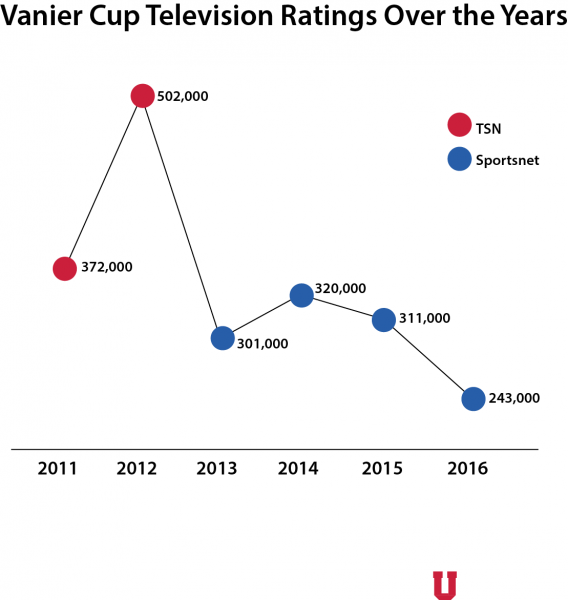 Viewership for the Vanier Cup has fallen over the past three years to 243,000 viewers. 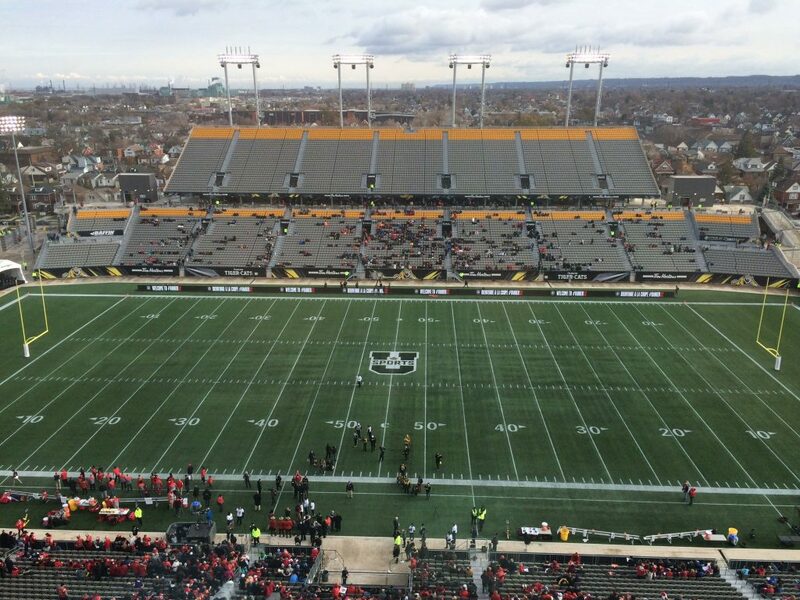 The Vanier is the crown jewel of the U Sports package and interest is waning. The winter championships don’t draw well either (number five). U Sports could be forced to look elsewhere, but Canada’s small media landscape leaves a few options. Naturally, TSN is the other option, and this partnership could be a good one. TSN needs content after losing the NHL contract. They have the rights to some regional hockey games but have not filled the gap with original programming. TSN is also the sole broadcaster of the Canadian Football League and a partnership between TSN and U Sports could create more meaning for university football. Currently, the CFL Draft comes and goes without much fanfare, though the league is trying to address that. The main obstacle is that the draftees are just names on a list. Only diehard fans of Canadian football will have seen the players before. In theory, TSN could pick up the rights for a small fee and broadcast one U Sports football game a week. This creates live Canadian programming and could drive interest in the CFL too. The Sportsnet deal was met with cautious optimism by most followers of the league. That optimism has faded. Instead of galvanizing a league and putting it in the national spotlight, U Sports’ relevance has faded through the contract. Viewership is down, Sportsnet has not broadcasted more events even though that was advertised in the original press release, and the total visibility has been limited to three weekends a year. What, if anything, comes next for U Sports on TV will provide more detail on the property’s long-term viability.